Carole Radziwill's style has always intrigued me. From her pedigreed sofa (given to her by Lee Radziwill, mother-in-law, tastemaker and sister of Jacqueline Kennedy Onassis) to her sleek fashion choices, she has been low-key upstaging all of us for years. Now that AD has stepped into her newly redone SoHo duplex and shared their findings via a glamorous magazine spread, it's safe to say the secret is out. Radzi is flat out fabulous and has firmly stepped into her role as style icon. Carole: "I’m the girl who is going to go home, shut her door, and be in solitude, surrounded by beautiful things"
What I love about this space is how decadently feminine it is. Touchable velvets, pale blues, Mongolian wool accents, dusty pink tufted headboard, silk panel drapes from floor to marvelously high (silver-leafed) ceiling. Carole is not kidding around here. 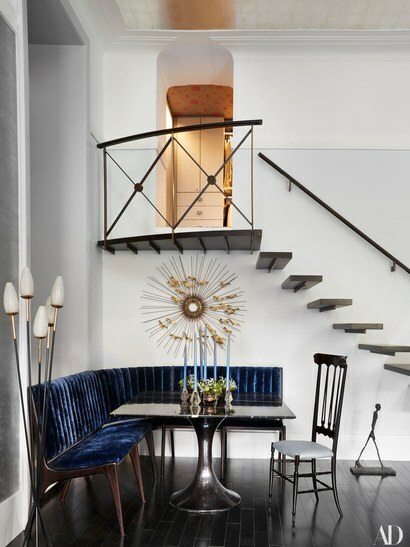 The designer we can credit for this amazing space is John Bossard, whom she met at a party in Aspen (have to love those fortuitous celebrity run-ins, right?). Having studied her space before, I am smitten by the glorious transformation he achieved. She always had a stylish apartment, but now it seems more voluminous, more luminous and the type of elegant private retreat you'd be hard pressed to ever want to leave. Naturally, I'm completely obsessed with the "jewel box" effect John achieved and so happy Carole let him have the freedom to fully express his fantastic creative vision. Confession: Before this piece in AD I'd never heard of John, but the space speaks for itself. His work is easily on par with Melanie Turner (whom I adore!) and his use of color & texture make me think of Suzanne Kasler. I am completely in love with the "grown up" femininity of the design. 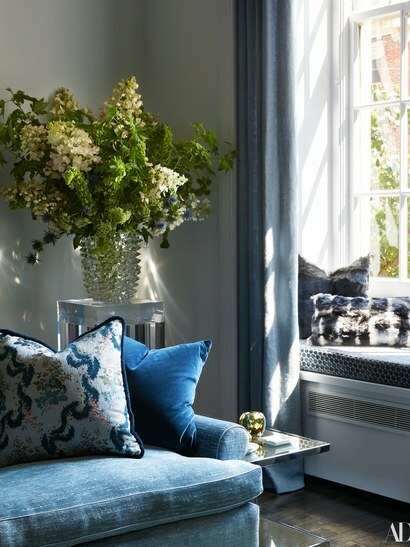 And for a self-described homebody like Carole, this must be pure heaven to call home.